For those out there who love some tasty beef jerky, it’s turns out you can easily make it all on your own! Rather than emptying your wallet every time you get a craving, just get about two pounds of beef and follow our easy recipe below. Not only will your friends love the taste, but you will love it so much that you won’t want to share! So, let’s get started on that homemade beef jerky! To begin, trim all of the visible fat off the beef, and then set it on some plastic wrap. From there, freeze the beef between 30 and 40 minutes until it’s firm but isn’t frozen. Now, add the vinegar, the apple juice, the garlic, the onion, the chiles, the Manuka honey, the Dijon mustard, the liquid smoke, the fish sauce, the paprika, the black pepper, and the red pepper flakes into a food processor or blender. Purée until the mixture is smooth before scraping it into a resealable, heavy-duty plastic bag. Take the meat out of your freezer, cutting it into slices (against the grain) that are 1/8-inches thick. Add these slices into your marinade, stirring in order to coat them evenly. For 8-12 hours, marinate your beef slices in your refrigerator. Line the bottom of your oven with double layers of heavy-duty aluminum foil, setting the racks on the top rungs. Once the oven is ready, remove the beef from your marinade, which you can then discard. Place the beef slices on the racks in your oven directly, leaving roughly ½ an inch between them. Set your oven to 170 degrees Fahrenheit, placing a wooden spoon handle into the door in order to have it somewhat ajar. For about three hours, dry the beef slices before using tongs to turn them over to dry for another 3-4 hours—or until a slice easily rips in half. 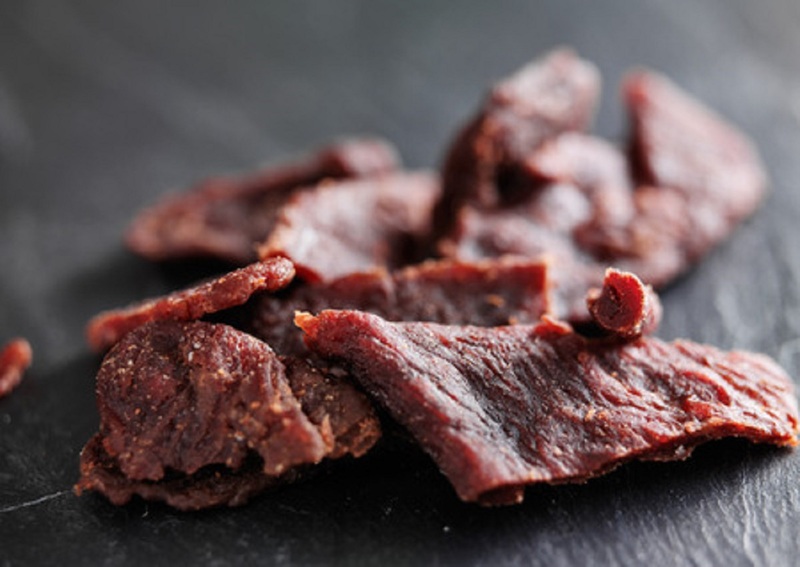 Move the jerky onto wire racks for cooling, which should be a minimum of six hours. Once cooled down, transfer the jerky into an airtight container, which should be stored in a cool room temp for a maximum of two months. Enjoy your Homemade Beef Jerky!